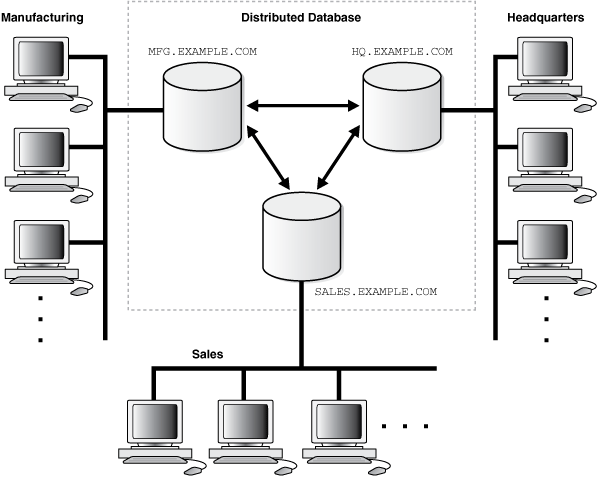 Concepts related to distributed databases include distributed database architecture, database links, transaction processing, application development, and character set support. Distributed database administration includes topics related to site autonomy, security, auditing database links, and administration tools. A transaction is a logical unit of work constituted by one or more SQL statements executed by a single user. A transaction begins with the user's first executable SQL statement and ends when it is committed or rolled back by that user. A remote transaction contains only statements that access a single remote node. A distributed transaction contains statements that access multiple nodes. Application development in a distributed system raises issues that are not applicable in a non-distributed system. Different databases and clients can use different character sets in a distributed environment. A homogenous distributed database system includes only Oracle databases. A heterogeneous distributed database system includes both Oracle databases and non-Oracle databases. A homogenous distributed database system is a network of two or more Oracle Databases that reside on one or more systems. The terms distributed database and distributed processing are closely related, yet have distinct meanings. The terms distributed database system and database replication are related, yet distinct. Figure 31-1 illustrates a distributed system that connects three databases: hq, mfg, and sales. An application can simultaneously access or modify the data in several databases in a single distributed environment. For example, a single query from a Manufacturing client on local database mfg can retrieve joined data from the products table on the local database and the dept table on the remote hq database. Description of "Figure 31-1 Homogeneous Distributed Database"
An Oracle Database distributed database system can incorporate Oracle Databases of different releases. All supported releases of Oracle Database can participate in a distributed database system. Nevertheless, the applications that work with the distributed database must understand the functionality that is available at each node in the system. A distributed database application cannot expect an Oracle7 database to understand the SQL extensions that are only available with Oracle Database. In a pure (that is, not replicated) distributed database, the system manages a single copy of all data and supporting database objects. Typically, distributed database applications use distributed transactions to access both local and remote data and modify the global database in real-time. Heterogeneous Services (HS) is an integrated component within the Oracle Database server and the enabling technology for the current suite of Oracle Transparent Gateway products. Generic connectivity enables you to connect to non-Oracle Database data stores by using either a Heterogeneous Services ODBC agent or a Heterogeneous Services OLE DB agent. The Oracle Database server accesses the non-Oracle Database system using Oracle Heterogeneous Services with an agent. If you access the non-Oracle Database data store using an Oracle Transparent Gateway, then the agent is a system-specific application. For example, if you include a Sybase database in an Oracle Database distributed system, then you must obtain a Sybase-specific transparent gateway so that the Oracle Database in the system can communicate with it. Other than the introductory material presented in this chapter, this book does not discuss Oracle Heterogeneous Services. See Oracle Database Heterogeneous Connectivity User's Guide for more detailed information about Heterogeneous Services. HS provides the common architecture and administration mechanisms for Oracle Database gateway products and other heterogeneous access facilities. Also, it provides upwardly compatible functionality for users of most of the earlier Oracle Transparent Gateway releases. Both are included with your Oracle product as a standard feature. Any data source compatible with the ODBC or OLE DB standards can be accessed using a generic connectivity agent. In Figure 31-2, the host for the hq database is acting as a database server when a statement is issued against its local data (for example, the second statement in each transaction issues a statement against the local dept table), but is acting as a client when it issues a statement against remote data (for example, the first statement in each transaction is issued against the remote table emp in the sales database). Description of "Figure 31-2 An Oracle Database Distributed Database System"
A database link is a pointer that defines a one-way communication path from an Oracle Database server to another database server. To understand how a database link works, you must first understand what a global database name is. Each database in a distributed database is uniquely identified by its global database name. You can use the global name of a database as a loopback database link without explicitly creating a database link. When the database link in a SQL statement matches the global name of the current database, the database link is effectively ignored. Typically, a database link has the same name as the global database name of the remote database that it references. Oracle Database lets you create private, public, and global database links. Users of database links include connect user, current user, and fixed user. Create database links using the CREATE DATABASE LINK statement. After you have created a database link, you can execute SQL statements that access objects on the remote database. You must also be authorized in the remote database to access specific remote objects. Several restrictions apply to database links. For public and private database links, the link pointer is actually defined as an entry in a data dictionary table. To access the link, you must be connected to the local database that contains the data dictionary entry. For global database links, the link pointer is defined in a directory service. The different types of database links are described in more detail in "Types of Database Links". Description of "Figure 31-3 Database Link"
Users connect as themselves, which means that they must have an account on the remote database with the same user name and password as their account on the local database. Users connect using the user name and password referenced in the link. For example, if Jane uses a fixed user link that connects to the hq database with the user name and password scott/password, then she connects as scott, Jane has all the privileges in hq granted to scott directly, and all the default roles that scott has been granted in the hq database. A user connects as a global user. A local user can connect as a global user in the context of a stored procedure, without storing the global user's password in a link definition. For example, Jane can access a procedure that Scott wrote, accessing Scott's account and Scott's schema on the hq database. When a user must establish a connection to a remote server from a particular server process, the process can reuse connections already established to the remote server. The reuse of the connection can occur if the connection was established on the same server process with the same database link, possibly in a different session. In a non-shared database link, a connection is not shared across multiple sessions. For example, assume that employees submit expense reports to Accounts Payable (A/P), and further suppose that a user using an A/P application must retrieve information about employees from the hq database. The A/P users should be able to connect to the hq database and execute a stored procedure in the remote hq database that retrieves the desired information. The A/P users should not need to be hq database users to do their jobs; they should only be able to access hq information in a controlled way as limited by the procedure. The database forms a global database name by prefixing the database network domain, specified by the DB_DOMAIN initialization parameter at database creation, with the individual database name, specified by the DB_NAME initialization parameter. For example, Figure 31-4 illustrates a representative hierarchical arrangement of databases throughout a network. Description of "Figure 31-4 Hierarchical Arrangement of Networked Databases"
In this case, the @db1.example.com portion of the SQL statement is effectively ignored. For example, if the global database name of a database is sales.us.example.com, then the database link is also called sales.us.example.com. When you set the initialization parameter GLOBAL_NAMES to TRUE, the database ensures that the name of the database link is the same as the global database name of the remote database. For example, if the global database name for hq is hq.example.com, and GLOBAL_NAMES is TRUE, then the link name must be called hq.example.com. Note that the database checks the domain part of the global database name as stored in the data dictionary, not the DB_DOMAIN setting in the initialization parameter file (see "Changing the Domain in a Global Database Name"). If you set the initialization parameter GLOBAL_NAMES to FALSE, then you are not required to use global naming. You can then name the database link whatever you want. For example, you can name a database link to hq.example.com as foo. Oracle recommends that you use global naming because many useful features require global naming. User called PUBLIC. View ownership data through views shown for private database links. No user owns the global database link. The global database link exists in a directory service. Creates a network-wide link. When an Oracle network uses a directory server and the database is registered in the directory service, this information can be used as a database link. Users and PL/SQL subprograms in any database can use a global database link to access objects in the corresponding remote database. Global database links refer to the use of net service names from the directory server. When an Oracle network uses a directory server, an administrator can conveniently manage global database links for all databases in the system. Database link management is centralized and simple. There is no user data associated with a global database link definition. A global database link must operate as a connected user database link. When creating the link, you determine which user should connect to the remote database to access the data. Connected user links have no connect string associated with them. The advantage of a connected user link is that a user referencing the link connects to the remote database as the same user, and credentials do not have to be stored in the link definition in the data dictionary. A benefit of a fixed user link is that it connects a user in a primary database to a remote database with the security context of the user specified in the connect string. A local user accessing a database link in which no fixed username and password have been specified. If SYSTEM accesses a public link in a query, then the connected user is SYSTEM, and the database connects to the SYSTEM schema in the remote database. A global user in a CURRENT_USER database link. The global user must be authenticated by an X.509 certificate (an SSL-authenticated enterprise user) or a password (a password-authenticated enterprise user), and be a user on both databases involved in the link. A user whose username/password is part of the link definition. If a link includes a fixed user, the fixed user's username and password are used to connect to the remote database. The following users cannot be target users of database links: SYS and PUBLIC. An externally-authenticated user cannot connect to the remote database using a connected user database link unless a secure protocol or a network authentication service option is used. If the connected user database link is accessed from within a definer's rights function, procedure, or package, then the definer's authorization ID is used to connect as a remote user. For example, if user jane calls procedure scott.p (a definer's rights procedure created by scott), and the link appears inside procedure scott.p, then scott is the connected user. To run a definer's rights function, procedure, or package that includes a connected user database link, the user who invokes the function, procedure, or package must be granted the INHERIT REMOTE PRIVILEGES privilege. For example, local user joe can create a public database link in joe's schema that specifies the fixed user scott with password password. If jane uses the fixed user link in a query, then jane is the user on the local database, but she connects to the remote database as scott/password. Fixed user links have a user name and password associated with the connect string. The user name and password are stored with other link information in data dictionary tables. If the stored object is an invoker's rights function, procedure, or package, then the invoker's authorization ID is used to connect as a remote user. For example, if user jane calls procedure scott.p (an invoker's rights procedure created by scott), and the link appears inside procedure scott.p, then jane is the current user. Oracle Database PL/SQL Language Reference for more information about invoker's rights functions, procedures, or packages. Oracle Database uses the global database name to name the schema objects globally. To access a remote schema object, you must be granted access to the remote object in the remote database. Oracle Database lets you create synonyms so that you can hide the database link name from the user. To resolve application references to schema objects (a process called name resolution), the database forms object names hierarchically. Further, to perform any updates, inserts, or deletes on the remote object, you must be granted the READ or SELECT privilege on the object, along with the UPDATE, INSERT, or DELETE privilege. Unlike when accessing a local object, the READ or SELECT privilege is necessary for accessing a remote object because the database has no remote describe capability. The database must do a SELECT * on the remote object to determine its structure. For example, the database guarantees that each schema within a database has a unique name, and that within a schema each object has a unique name. As a result, a schema object name is always unique within the database. Furthermore, the database resolves application references to the local name of the object. Site autonomy means that each server participating in a distributed database is administered independently from all other databases. The database supports all of the security features that are available with a non-distributed database environment for distributed database systems, including password authentication for users and roles, some types of external authentication for users and roles including Kerberos version 5 for connected user links, and login packet encryption for client-to-server and server-to-server connections. The database administrator has several choices for tools to use when managing an Oracle Database distributed database system. Database links are either private or public, authenticated or non-authenticated. When using a connected user or current user database link, you can use an external authentication source such as Kerberos to obtain end-to-end security. In a distributed database system, you must carefully plan the user accounts and roles that are necessary to support applications using the system. For centralized user and privilege management, you must consider the authentication method. You can also consider exclusively mapped global users or shared schema users. When connecting to the remote database, the database uses security information (userid/password) taken from the local session. Hence, the link is a connected user database link. Passwords must be synchronized between the two databases. Works the same as a private nonauthenticated link, except that all users can reference this pointer to the remote database. All users on the local database can access the remote database, and all use the same userid/password to make the connection. The OUTBOUND_DBLINK_PROTOCOLS initialization parameter can specify Oracle Net transport protocols restricting any outbound database link communication to use only the protocols from the specified list. The ALLOW_GLOBAL_DBLINKS initialization parameter can allow or disallow LDAP lookup for global database links information. In end-to-end authentication, credentials are passed from server to server and can be authenticated by a database server belonging to the same domain. For example, if jane is authenticated externally on a local database, and wants to use a connected user link to connect as herself to a remote database, the local server passes the security ticket to the remote database. As you create the database links for the nodes in a distributed database system, determine which user accounts and roles each site must support server-to-server connections that use the links. The database provides different ways for you to manage the users and their privileges in a distributed system. One option for centralizing user and privilege management is to create a global user in a centralized directory and a user in every database to which the global user must connect. The shared schema users functionality allows a global user to be centrally managed by an enterprise directory service. Users who are managed in the directory are called enterprise users. You can create global users who are authenticated using passwords, Kerberos, or PKI certificates. You can then manage these users and their authorizations in a directory using an independent enterprise directory service. This common technique simplifies security management for distributed environments. You can use the Oracle Advanced Security option to enhance Oracle Net and the security of an Oracle Database distributed database system. Microsoft Windows native authentication is an example of a non-Oracle authentication solution. This solution allows a single global database user to be authenticated by a centralized directory and map the database user exclusively to a directory user. The exclusively mapped global user solution has the consequence that you must create a user called fred on every database that this user must access. Because most users need permission to access an application schema but do not need their own schemas, the creation of a separate account in each database for every global user creates significant overhead. Because of this problem, the database also supports shared schema users, which are global users that can access a single, generic schema in every database. The administrator of each database is not required to create a global user account for each enterprise user on each database to which the enterprise user must connect. Instead, multiple enterprise users can connect to the same database schema, called a shared schema. For example, suppose jane, bill, and scott all use a human resources application. The hq application objects are all contained in the guest schema on the hq database. In this case, you can create a local global user account to be used as a shared schema. This global user name, that is, shared schema name, is guest. jane, bill, and scott are all created as enterprise users in the directory service. They are also mapped to the guest schema in the directory, and can be assigned different authorizations in the hq application. Description of "Figure 31-5 Global User Security"
You can create a global role using the GLOBALLY AS [domain_name_of_directory_group] clause of the CREATE ROLE or ALTER ROLE statement to map a directory group to a global role. The global user must be authorized to use the global role by the enterprise directory service before the role is enabled. See Oracle Database SQL Language Reference for the syntax of CREATE ROLE and ALTER ROLE statements. You can authenticate and authorize users directly with Microsoft Active Directory. Thus, Oracle database users and roles can map directly to Active Directory users and groups without using Oracle Enterprise User Security (EUS) or any other intermediate directory service. See Oracle Database Security Guide for more information about configuring users with Microsoft Active Directory. Fixed user link hq.example.com connects local user jane to the remote hq database as remote user scott. Oracle Enterprise Manager Cloud Control is the Oracle Database administration tool that provides a graphical user interface (GUI). Cloud Control provides administrative functionality for distributed databases through an easy-to-use interface. Besides its network administration capabilities, Oracle Simple Network Management Protocol (SNMP) support allows an Oracle Database server to be located and queried by any SNMP-based network management system. Administer multiple databases. You can use Cloud Control to administer a single database or to simultaneously administer multiple databases. Dynamically execute SQL, PL/SQL, and Cloud Control commands. You can use Cloud Control to enter, edit, and execute statements. Cloud Control also maintains a history of statements executed. Thus, you can reexecute statements without retyping them, a particularly useful feature if you must execute lengthy statements repeatedly in a distributed database system. Oracle has deprecated SNMP support in Oracle Net Listener. Oracle recommends not using SNMP in new implementations. See Oracle Database Upgrade Guide for more information. A remote SQL statement either queries or modifies one or more remote tables, all of which reside at the same remote node. A distributed SQL statement either queries or modifies data on two or more nodes. The mechanics of a remote or distributed statement using shared SQL are essentially the same as those of a local statement. A remote transaction contains one or more remote statements, all of which reference a single remote node. A distributed transaction is a transaction that includes one or more statements that, individually or as a group, update data on two or more distinct nodes of a distributed database. The database two-phase commit mechanism guarantees that all database servers participating in a distributed transaction either all commit or all roll back the statements in the transaction. Whenever a SQL statement includes a reference to a global object name, the database searches for a database link with a name that matches the database name specified in the global object name. It is important to understand how the remote schema is determined when a local Oracle Database connects to a remote database. A global object name can be complete or partial. The SQL text must match, and the referenced objects must match. If available, shared SQL areas can be used for the local and remote handling of any statement or decomposed query. A two-phase commit mechanism also protects implicit DML operations performed by integrity constraints, remote procedure calls, and triggers. A global object name is an object specified using a database link. For SQL statements with a complete global database name, the database searches only for links that match the specified global database name. If any part of the domain is specified, then the database assumes that a complete global database name is specified. If a global object name references an object in the local database and a database link name is not specified using the @ symbol, then the database automatically detects that the object is local and does not search for or use database links to resolve the object reference. The database searches for a database link called orders.us.example.com. The database performs this operation to determine the path to the specified remote database. In this case, both the database name (prod1) and domain components (us.example.com) are specified, so the database searches for private, public, and global database links. If the network domain for locdb is us.example.com, then the database appends this domain to orders to construct the complete global database name of orders.us.example.com. The database searches for database links that match only the constructed global name. If a matching link is not found, the database returns an error and the SQL statement cannot execute. Searches until it finds a link specifying a database string. If matching database links are found and a string is never identified, the database returns an error. After the local Oracle Database connects to the specified remote database on behalf of the local user that issued the SQL statement, object resolution continues as if the remote user had issued the associated SQL statement. An example illustrates how the database resolves a complete global object name and determines the appropriate path to the remote database using both a private and public database link. An example illustrates how the database resolves a partial global object name and determines the appropriate path to the remote database using both a private and public database link. The remote database is named sales.division3.example.com. The local database is named hq.division3.example.com. The database finds a matching private database link in the schema jward. Nevertheless, the private database link jward.sales.division3.example.com does not indicate a complete path to the remote sales database, only a remote account. Therefore, the database now searches for a matching public database link. 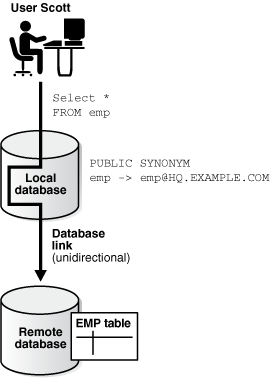 The database connects to the remote database as scott/password and searches for and does not find an object named emp in the schema scott. A view, synonym, or PL/SQL program unit (for example, a procedure, function, or trigger) can reference a remote schema object by its global object name. Global name changes can affect views, synonyms, and procedures that reference remote data using partial global object names. Scenarios illustrate global name changes. If the global object name is complete, then the database stores the definition of the object without expanding the global object name. If the name is partial, however, then the database expands the name using the domain of the local database name. Does not expand partial global names. The data dictionary stores the exact text of the defining query. Instead, the database expands a partial global object name each time a statement that uses the view is parsed. If the global name of the referenced database changes, views and procedures may try to reference a nonexistent or incorrect database. However, synonyms do not expand database link names at run time, so they do not change. A scenario illustrates a situation in which both global database names change. A scenario illustrates a situation in which one global database name changes. In this case, the defining query of the employee_names view expands to a nonexistent global database name. However, the employee synonym continues to reference the correct database, hq.uk.example.com. An Oracle Database distributed database system has features that allow application developers and administrators to hide the physical location of database objects from applications and users. The Oracle Database distributed database architecture provides query, update, and transaction transparency. For example, standard SQL statements such as SELECT, INSERT, UPDATE, and DELETE work just as they do in a non-distributed database environment. Additionally, applications control transactions using the standard SQL statements COMMIT, SAVEPOINT, and ROLLBACK. There is no requirement for complex programming or other special operations to provide distributed transaction control. Oracle Database supports environments in which clients, Oracle Database servers, and non-Oracle Database servers use different character sets. NCHAR support is provided for heterogeneous environments. In a client/server environment, set the client character set to be the same as or a subset of the Oracle Database server character set. In a non-heterogeneous environment, the client and server character sets should be either the same as or subsets of the main server character set. In a heterogeneous environment, the globalization support parameter settings of the client, the transparent gateway, and the non-Oracle Database data source should be either the same or a subset of the database server character set. You can set a variety of National Language Support (NLS) and Heterogeneous Services (HS) environment variables and initialization parameters to control data conversion between different character sets. Figure 31-6 illustrates a client/server environment. Description of "Figure 31-6 NLS Parameter Settings in a Client/Server Environment"
Description of "Figure 31-7 NLS Parameter Settings in a Homogeneous Environment"
Figure 31-8 illustrates a heterogeneous distributed environment. Transparent gateways have full globalization support. Description of "Figure 31-8 NLS Parameter Settings in a Heterogeneous Environment"